The vacation had to be interrupted by a business trip to Boston to meet with the CEO of a client. Normally, I would have been able to take a pass, but the project involved an extraordinary program by this client help address the problem of hunger in America. It was the kind of project I have been seeking for years now and offered an opportunity to address a real social problem. 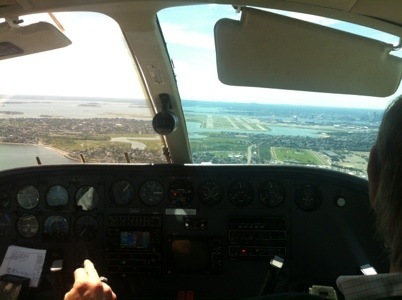 While getting to Boston would not be easy, as it turned out, getting back was an ordeal. 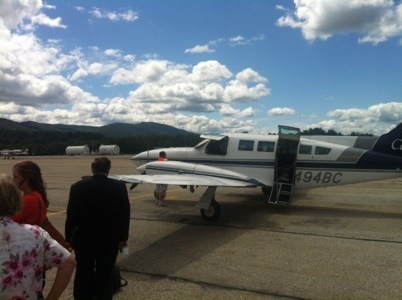 Long story short, I drove 2.5 hours to Rutland, Vermont and took a ten seater plane to Boston. As we boarded the plane, the gate agent said to the man in front of me, “you’re going to be the copilot today.” I thought he was kidding. He wasn’t. That passenger sat in the copilot’s seat. The flight was only moderately bumpy and we never flew above 7,000 feet. Coming into Logan on that kind of plane was actually kind of a kick. See the picture below, taken from my seat. The meeting went reasonably well, but the trip back was a nightmare. All flights to Rutland were cancelled because the weather computer was down. Their plan was to transport us by “limo,” aka shuttle van, to Rutland. After waiting around for a while, they ended up flying us to Lebanon, New Hampshire, where we were shuttled by “Gramps” to Rutland. As it turned out, Gramps only took us halfway on the hour and fifteen minute trip. We (me and another guy who had started his day in Eugene, Oregon) were transferred to into another shuttle and arrived at Rutland airport at 11 pm, 4 hours later than expected. I then started by 2.5 hour drive back to camp. Arriving at camp at 1:30 am, I took our rickety motor boat the mile across the lake where they had lit up the main dock for me to steer toward. As I drifted into the slip, there was a huge splash to my right as a snapping turtle dove off the dock where he was presumably sleeping. He about two feet in diameter and cruised into the slip behind me. I was extra careful getting out of the boat onto the dock.